Home > Heavy Duty V Belts > Poly-V Ribbed (Micro -V) Belts > J, PJ Section Poly-V (Micro V) Belts - 3/32" Rib Width. > 410J7 Poly-V Belt. Metric 7-PJ1041 Drive Belt. Consumer Brand. > 410J4 Gates Micro-V Belt. 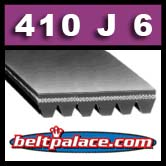 Metric Belt PJ1041 > 410J4 Poly-V Belt (Consumer Brand), Metric 4-PJ1041 Motor Belt. > 410J6 Poly-V Belt (Consumer brand), Metric 6-PJ1041 Motor Belt. Gates 410J6 Micro-V rib belt. PJ1041 Metric Belt. 41" Length (1041mm). 6 rib Micro-V Belt is 9/16" wide, J Series.